While developing a module, sometimes it can be handy to hide some implementation detail methods and functions to your final module users, especially when those routines involve experimental code of any kind. Jungle Ide allows you to hide any element from intellisense by prefixing it with a hidden command. 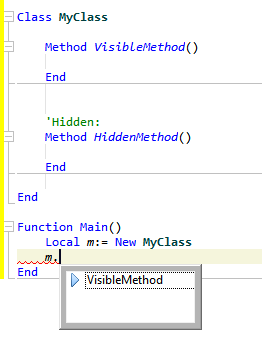 You can see in this small sample, how the “HiddenMethod” is just not shown in the intelliprompt window. Notice that there is a : character following the Hidden word, and that this keyword appears into a single line command. Notice that you can enable an option in the Jungle Ide preferences, into the Monkey section, to force Jungle Ide show all hidden keywords in intelliprompt. That’s handy when you’re the one writing and using those hidden routines!